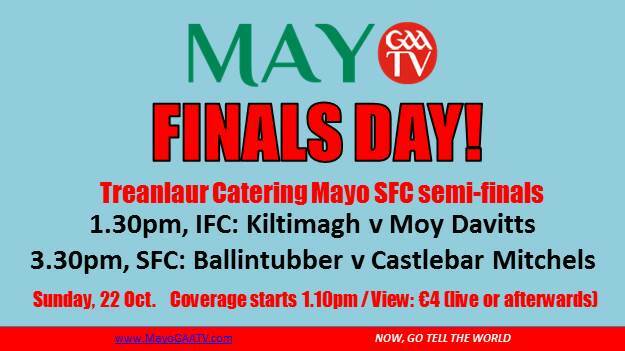 GAMES: Egan Jewellers Mayo IFC Final; Treanlaur Catering Mayo SFC Final. TEAMS: Moy Davitts v Kiltimagh, intermediate, 1.30pm; Ballintubber v Garrymore or Castlebar Mitchels, senior, 3.30pm. COMMENTARY TEAM: Liam Horan (presenter), Tom Carney (comentator), Jimmy Lyons (analyst), Stephen Carolan (analyst), Michael Conroy (analyst), Austin O’Malley (analyst), Brendan Mooney (Kiltimagh), Gary Ruane (Moy Davitts), Jackie Heneghan (Ballintubber) and Kevin Filan (Castlebar Mitchels). PRODUCTION TEAM: Conor Dowd (videographer), Brendan Dowd (editor), Dessie Campbell (director), Liam Hennelly, Ariadna Gomez Kelly (broadcast assistant & social media), Paula Ballester Murat (broadcast assistant), Damian Brennan (broadcast assistant), Shane Halligan (technical / web), Tony Kennedy (technical). COST: €4 for live viewing (see link to Player below). We recommend buying early to make sure you have everything in order. Any problems getting onto live broadcast, check out our FAQs & Troubleshooting section. In fact, we recommend you read FAQs & Troubleshooting before purchasing as it outlines in full the process and anticipates many of the issues that arise. In 99 per cent of cases, those issues are easily resolved. In the occasional cases where the streaming still doesn’t work, we provide full refunds. SPONSORSHIP: Sponsorship and advertising opportunities available. Call Liam Horan on +353 87 9185 867.